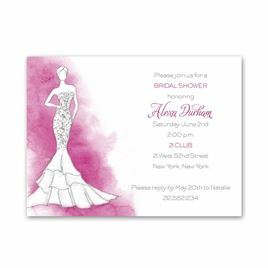 Friends and family will be fashion struck by these stunning bridal shower invitations, which feature a splash of color behind a bride donning a beautiful mermaid gown. Customize design and wording to fit your celebration's colors and style. Registry information may be printed on the backs. Envelopes are included with these bridal shower invitations.